*This page includes all the Cute and Colourful outfits many of which are already sold. Waist 13.2cm, Hips 19cm, Shoulder width 8.2cm, Arm length 12.5cm, Leg length 23cm. 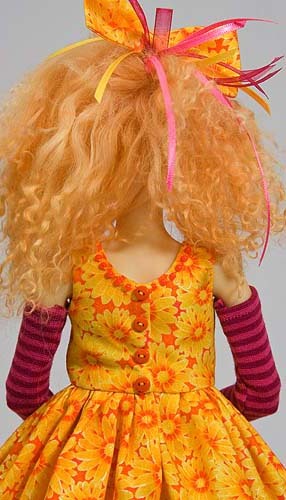 *The costumes will fit other dolls with similar measurements. Ensemble includes a sleeveless cotton print dress embellished with a purple ribbon and yellow satin rose at the waist. The tulle underskirt is sewn directly into the dress. 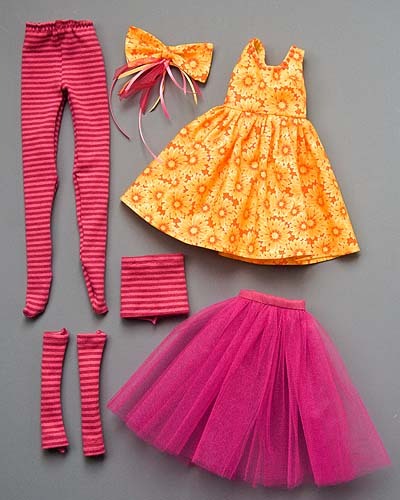 Also included are stretchy orange striped tube top, arm warmers and tights, and a hair ornament to match. Ensemble includes a sleeveless cotton print dress with a beaded neckline. The tulle underskirt is sewn directly into the dress. Also included are stretchy pink striped tube top, arm warmers and tights, and a hair ornament to match. Ensemble includes a sleeveless cotton print dress with a purple ribbon and rose at the waist. The tulle underskirt is a completely separate unit, with a snap closure at the waist. Also included are stretchy purple striped tube top, arm warmers and tights, and a hair ornament to match. Ensemble includes a sleeveless cotton print dress with a turquoise blue ribbon at the waist. The tulle underskirt is a completely separate unit, with a snap closure at the waist.